Blurb: Willfully stubborn, innocently courageous, Callie Whitcomb braves a journey through the treacherous highlands to the MacPherson castle. Callie flees from an unwanted marriage as well as her ruthless half brother. Naively she believes Colin MacPherson, the head of the clan, is loyal to her father and will give her sanctuary, protecting her from the vile plans that have been made for her. As hard and as unyielding as the winter storms that sweep through the countryside, Colin is irresistibly drawn to the impetuous beauty who has magically appeared on his doorsteps. Despite his vows of revenge against her father, she stirs his passion as well as his sense of justice...but to love her would violate all his vows of revenge. My review: Men in kilts. Men of honor. Gotta love those highland men. 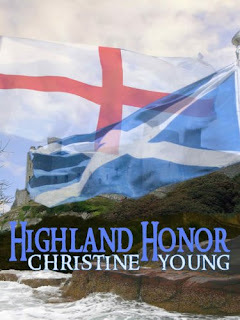 And I did in the first title of Christine Young's new series, Highland Honor. Colin "Hawke" MacPherson is the chief clansman, single, and devoted to taking care of his people and his lands. He has a tremendous amount of responsibilities. But in the back of his mind is the senseless murder of his beloved father, beheaded for something he did not do. Like his father, he is an honorable man and seeks to uncover the truth--somehow. When a beautiful blond walks into a tavern, he has no idea Lady Whitcomb is the daughter of his arch enemy. Mistaking her for someone else, he takes her to his castle where he is aghast to learn her true identity. But by then, it is too late. He has already fallen for her. I was immediately taken into this book with the suspense-filled opening scene. Callie is fleeing her brutal brother, Archibald. When someone sees her, she plays along with their assumption, wishing to get as far away from her stepbrother and fiance Huntington as quickly as she can. This English lass never thought she'd wind up in Scotland with the Hawke but when she does she asks for asylum and he grants it to her. Until she is found out and then given an ultimatum: stay in the safe confines of the MacPherson lands and marry her family's dreaded enemy or return home to the evil machinations of Archibald and marry a man she detests, Lord Simon Huntington? Callie decides to stay put. I liked Highland Honor but found some parts in the beginning confusing. And as much as I tried to sympathize with Callie, she would do something or think something and I would give up on her. She was spunky at times but mostly her damsel in distress routine did become tiresome. Towards the end I was hoping she would take better care of her body instead of escaping from being kidnapped (again) by rolling down an embankment. I would have liked a bit more depth to her instead of the reiteration of her insecurities or situation with Colin. I may not have been much of a fan of the lady, but the MacPherson family was a clan I could rally behind. From the strong, honorable leader, Colin, to his dependable brother Ian and feisty sister, Lainie, I was taken by all of them. Their interactions gave the story heart and a strong foundation for the other stories in the series to follow. Colin and Callie's love scenes were well scripted and the way he took heed of her innocence came across as refreshingly honest. I also liked the secondary cast of characters, from Jarrod to Victoria, and truly despised Callie's stepbrother and Simon as much as she did. Ultimately this story is about honor and revenge. Both Callie's relentless pursuit of the truth in clearing her father's name and Colin's refusal to involve her for reasons of keeping her safe were, well, in a word, honorable. The pacing ebbed and flowed like the tides outside the MacPherson castle and the author's lovely descriptions of sunrises and sunsets helped me get comfortable in this period piece jam packed full of adventure, betrayal, revenge, justice and a maturing gentle love story. 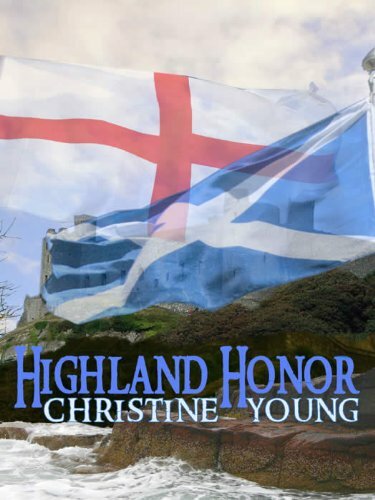 Fans of Highland romance will want to add Highland Honor to their list. Favorite excerpt: "A few days later, unable to hide his fear for Callie, Hawke watched his men help Callie down the rope ladder and into the small boat. Lachlan stood by his side on the deck of the Aphrodite. He wished Ian stood on the other side. Two months had passed and there was still no word of Ian. Now this. She had kept herself apart from him. His heart had broken. She had not spoken to him on the long journey home. He missed her desperately. He wanted to feel her silken warmth surrounding him, and wanted to hear her laughter. With more control than he'd ever possessed, he gave her the space she seemed to need and the time to sort through her thoughts. He wondered what had happened to her. As she walked away from him, her back was stiff, her shoulders squared. Her clothes were dirty and ragged, yet she held herself royally. He'd offered her every amenity. She'd stayed in his cabin, slept in his bed. She'd received food she didn't eat. His fingers tightened around the railing of the boat. More than once, he'd stopped himself at the threshold of her door, his heart pounding, his gut churning, needing to console. But she'd rejected every advance. "Ye should talk to her. Perhaps there is something ye should know that she hasn't told ye." Jarrod's softly spoken words did nothing to fill the emptiness in Hawke's heart. "And you know I've tried, old man." He breathed in deep and tried not to remember his wedding night, the languorous, bewitching hours spent with Callie aboard this ship. "Now ye have given up?" Cover comment: Not the usual romance cover art featuring a couple, this has the moorlands and the flag. It's OK.
Book source: From the author for my honest review during a book tour. I actually like the cover. It kind of gives you a sense of history.